Hitting the ground running at week 5 of The Starting Off Project, we have blusher. Take it or leave it, this little beauty essential is something every girl should have one of in their collection. I'll admit that I was a blush newbie until a few years ago. It just wasn't something I was familiar with, I'd not been taught how to use it and had to go in a little blind after realising that my face was screaming out for a little definition. This is exactly why you need blush in your makeup stash: it just makes you look less like a porcelain doll and puts some radiance back in. You might be asking what the point of putting foundation on if you're just going to add what essentially is your natural face colour back, but this is key. Foundation, plus a little blush makes it look like you're not wearing makeup at all! People can tell right away that you have lots of makeup on if you've got a monotone face with no natural contouring or colour. All blush is doing is giving us a fighting chance, and it can be as subtle or as strong as you wish it to be. Blush, much like bronzer, can some in many different forms but are most commonly seen in powder or cream formulations. Most blushes are matte, but there are a few that have a touch of shimmer or even incorporate some golden highlights, cancelling the need for another step to your makeup routine. For the daytime look matte is preferable, reserving shimmer/glitter blush for nighttime or even for a body glow if applied lightly. It's time to crack out that tried and tested skin colour theory again and if you don't know what you are, you can check back to my week 3 post about foundation. If you're warmed toned, peach, coral or even copper blush will suit your colouring best. For cool, pale pinks, rose, and berry shades are going to stand out. And for any neutral girls, pinky peaches and corals and burgundy will work a treat. I have neutral colouring and these are the shades I stick with and work best for me. Now to consider your skin balance. Powder is a good starting type and will work for most, but careful application is recommended for dry skin as it can cling to patches and appear slightly dull. It's best to build up this colour gradually as it's much harder to remove than it is to add. Cream or gel is great to use if you have dry or mature skin and has fantastic pigmentation. It gives a dewy, often sheer, finish that can be built up for a really dramatic look. Finally, stain or liquid blush is perfect for normal or oily skin beauties. It has unrivalled longevity and doesn't need reapplying through the day, but does take a little getting used to as it dries very quickly and blending is fairly rigorous. To apply any blush, use either a soft blush brush, stippling brush or your fingers if using a cream, gel or stain. What blush do you use? What is your next blush purchase? NARS blushers are my favourite! But I really want to try the Stila blush! Heard so many good things! I only have a few NARS blushes, and just the one Stila blush but it's a go-to during the summer. Daily, I use Sleek powder blushes as I think they are great and for a night time look I love Illamasqua's velvet blushes - they have a consistency like nothing else I have tried! I do love my Sleek blush palette, very pigmented and such a great price. 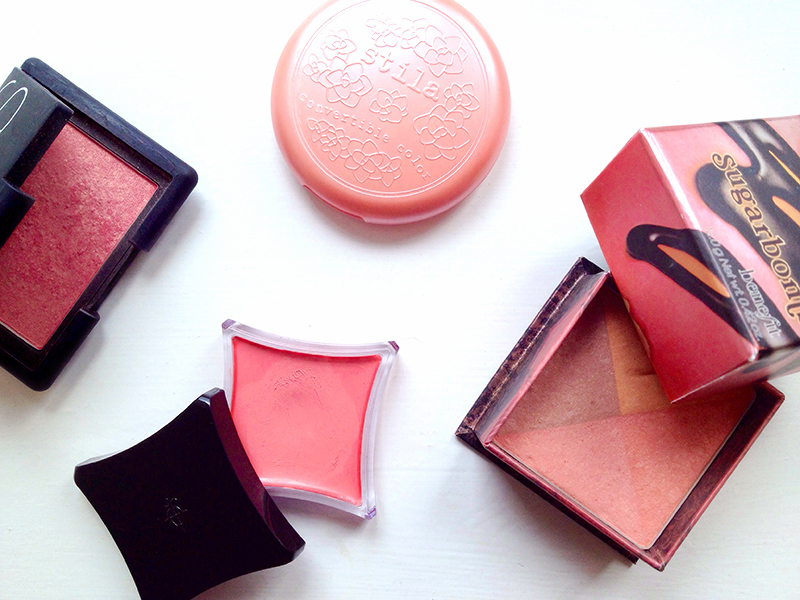 My favourite blushes are topshop, bourjois and illamasqua velvet blushes. I have stila powder blushes and I'm not mad about them, but I really want to try a convertible colour one. Definitely a cream blush girl. I keep hearing about these Illamasqua Velvet blushes, but not been lucky enough to have a test of them. If only I didn't have to order blind online, would love to swatch. And my favourite cream blushes are the Stila CCs but I love the Rimmel powder blushes, and they're so cheap ! I adore your blog, I have now followed you on bloglovin ! Thanks for the follow Madeline! I've not tried the Rimmel Powder blushes, I may have to look into those. It's amazing just how much it lifts your face, putting a bit of colour back in. I'm constantly trying to get my sister to add some to her routine! I agree that cream blush gives a dewy finish. I find it easy to blend with fingers, but for some reason I always lean more towards powder blush! Cream blush can be difficult to work with, especially when it smudges any underlying foundation. But there is a trick: setting powder before the cream blush. Totally want to try Tarte blushes, I'd heard nothing but good things. I'm currently in love with Benefit's Rockateur! Need this! I didn't think I did at first, but after a swatch I've fallen in love. I've been using a lot of bronzer as a form of blush recently, I just need a few lighter colours. Oh the Illamasqua blush looks beautiful!!! It was a blind purchase, but I'm so glad I got it. It's perfect! That blush seems amazing! I'm looking for more blushes to try, and I think I'm going to give this one a go!